Hellmann's Balsamic Vinaigrette is made with extra virgin olive oil, has no high-fructose corn syrup, and is Gluten-Free. The Hellmann's brand is recognized throughout the world for unrivaled quality and flavor and its commitment to real, simple ingredients, like extra virgin olive oil. Hellman's® bold Balsamic Vinaigrette features just the right amount of zesty Italian herbs, onion, sweet red bell pepper, robust garlic, black pepper and Extra Virgin Olive Oil. 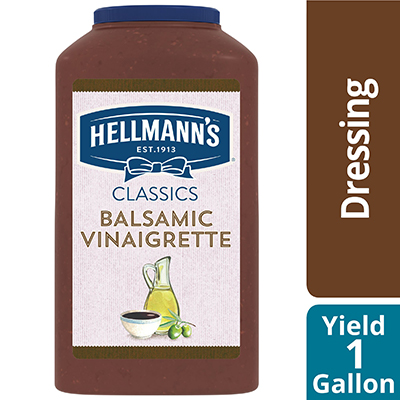 Hellmann's Balsamic Vinaigrette is great for green salads, bound salads, as a marinade, on vegetables, as a dip, sandwich sauce and more.